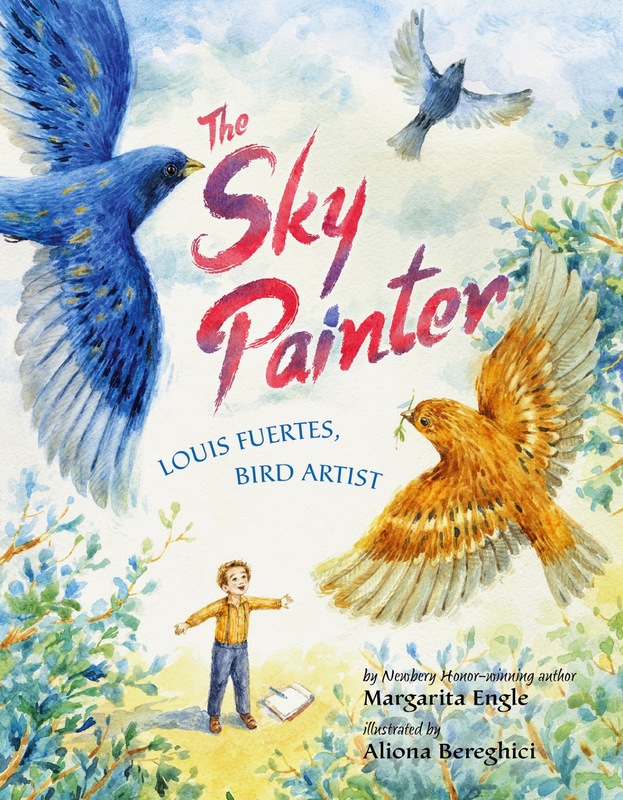 How many children know the name of Louis Agassiz Fuertes, whom Engle calls “the world’s greatest bird artist”—the New York-born Puerto Rican artist who painted birds in the wild and whose work helped encourage wildlife conservation all over the world? Now, because of Engle’s amazing picture biography in verse, more will. Bereghici’s lovely illustrations, rendered in watercolor and ink on a palette of bright natural colors with lots of white space, both highlight the details of Fuertes’s wild bird paintings and leave room for the birds’ common names, each penned on its own ribbon banner. Young readers will be enticed by other illustrations as well, such as a wild crow on the windowsill, holding young Louis’s paintbrush. Or a not-so-bemused Eastern Screech Owl chick, loosely tied to a table leg, “posing” for Louis. Or Louis’ having bandaged the wing of an injured bird, while a cat, aghast at a missed opportunity, looks on. Throughout, Bereghici’s illustrations complement Engle’s story of a boy, then a young man, then an adult, always with an expression of wonder at what he’s been given to do. I especially like the scene of Fuertes’s children, with that same wondrous look on their faces, as their father paints a portrait of a captive loon who’s been given temporary residence in the family bathtub. After all, how many children get to host a wild loon? In the bathtub? After reading this lovely book, I hope that teachers and librarians will plan field trips—even in the city, even just around the block—so that children can appreciate (and draw, if they want to) elements of the natural world all around them, including, but not limited to, “their own funny/ wild/ silly/ strange/ beautiful/ birds.” The Sky Painter is highly, highly recommended.